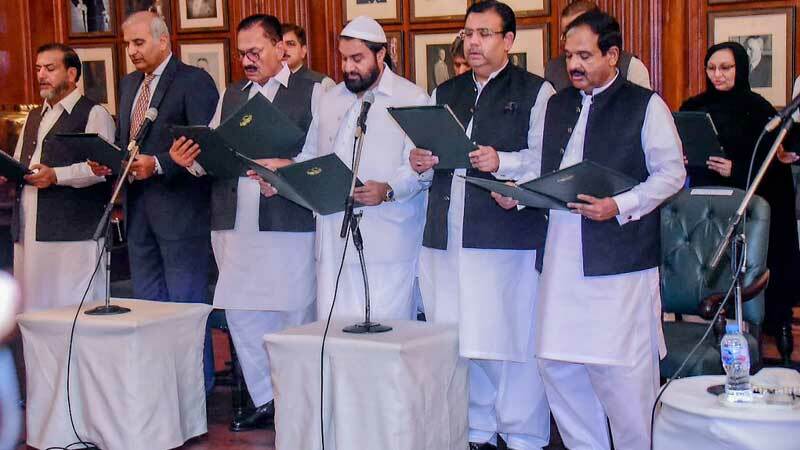 LAHORE: The provincial government of Pakistan Tehreek-i-Insaf (PTI) has inducted 12 new ministers in the second phase as they took oath on Wednesday in a ceremony held at Governor House. The 12 new ministers are Syed Saeedul Hassan Shah, Mehr Muhammad Aslam, Syed Hussain Jahania Gardezi, Muhammad Ajmal Cheema, Chaudhary Muhammad Akhlaq, Ashifa Riaz, Shaukat Ali Laleka, Ejaz Masih, Zawar Hussain Warraich, Muhammad Akhtar, Muhammad Khalid Mahmood and Jahanzeb Kachhi. Earlier, there were 23 ministers and one adviser in the Punjab cabinet. Three newly elected Members of Provincial Assembly also became advisers to the chief minister. They include Sardar Abdul Haye Dasti, Faisal Hayat and Hanif Pitafi. Sardar Abdul Haye Dasti was elected from PP-270 Muzaffargarh, Faisal Hayat from PP-125 Jhang and Hanif Pitafi from PP-289 Dera Ghazi Khan as independent candidates and later joined PTI. Similarly, the five special assistants to the CM inducted into the cabinet were also elected as independents. These include Salman Naeem who defeated Foreign Minister Shah Mahmood Qureshi in PP-217 Multan. Others were Syed Rafaqat Ali Gillani, Umar Faooq, Ameer Muhammad Khan and Khurram Sohail Khan Leghari, respectively. The overall volume of the Punjab cabinet stands at 44 if advisers and special assistants are also counted as there are now 35 ministers, five special assistants and four advisers in the provincial cabinet of PTI-led Punjab government. Among 44, 14 were elected as independent candidates on July 25 and later joined PTI. These independents have been obliged now by being inducted in the cabinet as they played a crucial role in making the PTI government in Punjab. Congratulating the new ministers, Punjab CM Sardar Usman Buzdar said that new ministers should perform their duties efficiently and work round the clock to fulfill the vision of Prime Minister Imran Khan. Provincial ministers should come up to the expectations of the people and “I am fully convinced that these ministers will work hard to achieve the goal of making a new Pakistan,” the CM said who was also present during the oath-taking ceremony. Punjab Governor Chaudhry Muhammad Sarwar administered oath to the newly appointed provincial ministers after the Punjab Chief Secretary Akbar Hussain Durrani read out the order of the appointment of the ministers. Deputy Speaker Punjab Assembly Sardar Dost Muhammad Mazari was also present on the occasion. The ceremony was attended by Punjab Inspector General of Police Muhammad Tahir, senior civil servants, parliamentarians, lawyers, journalists and members of the civil society. On August 28, at least 23 members of Punjab cabinet were sworn in by interim Punjab Governor Chaudhry Pervaiz Elahi.